I don’t know how a story could get better than the one in this movie – during World War 2, an Italian town elects the village drunk to become the new mayor of town. He sobers up once he realizes that the nazis are on the way to his town to take all the wine from the village, and he figures out a way to hide a million bottles of wine before they all show up! If you come into this movie without knowing too much, as I did, this film will be a real treat. I love it when Hollywood makes a film that’s more like a European film than a Hollywood one. Santa Vittoria stars an amazing international cast of Anthony Quinn, Anna Magnani, Virna Lisi, Hardy Kruger, and also a young Giancarlo Giannini. I had no idea I was watching Giannini since I’ve only seen him as a middle-aged man in movies. 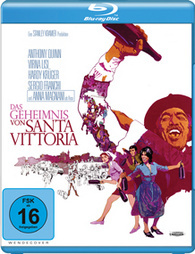 Santa Vittoria is funny, touching, and totally entertaining from beginning to end. 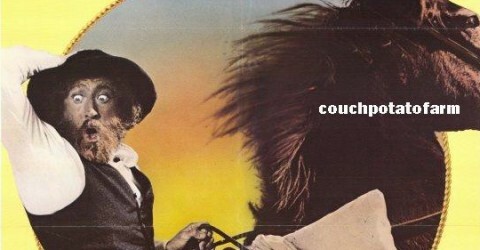 It’s one of those films you don’t want to end and you can’t get enough of Anthony Quinn’s Bombolini. Quinn has such a powerful presence and is an amazing actor. I’ve seen him in some bad films, but he’s always amazing to watch, even in his bad films. The German Region B blu-ray is very good. Don’t expect to be blown away as like with The Sound of Music, but the video and audio quality is very satisfying. Most of the time, the image looks clean, crisp, and bright. Only during night scenes, it won’t be so impressing, but still better than how a night scene would look on a DVD. Towards the end of the movie, some color discoloration and scratches pop up, but it’s so short, it’s not a big deal. The DTS-HD 2.0 is very good too – dialogue is clear and mixed very nicely. Listening to this audio, I felt right in the center of the Santa Vittoria town. The German subtitles are removable and there aren’t any extras. The Secret of Santa Vittoria is a totally underrated gem. I have never heard anyone mention this film in my life, even when they talk about films of Anthony Quinn. It’s too bad because this film is a must-see!